We had some weird weather this afternoon. When I got up, it was raining lightly. The sun peeked out for a bit, but then it clouded over and rained again for a while. When the rain had passed, I took Raven outside for a romp outdoors. It was windy and a bit nippy, but otherwise a glorious fall afternoon: blue skies, warm sun. I took a quick tour about the garden, then came back in to return to work. A short bit later I heard the pitter-pat of raindrops on the skylight again. I hadn’t noticed it happen, but I looked outside and sure enough, it was cloudy and overcast again. What the heck was going on? A trip over to the Environment Canada radar imagery for the radar station nearest us (eastern Ontario) answered the question of what, though it still left me with some whys. The above image is a screenshot of the radar as displayed by the website at mid-afternoon today. I find the online radar imagery to be an incredibly useful tool. It’s usually much more accurate for one to go online and look at the radar yourself, and create your own weather forecast for the afternoon, than it is to rely on the forecast posted online for your local town – or at least, it has been in my experience. Of course, this is only really useful for about half a day’s forecast at most. I primarily use it if I want to know if it’s going to rain while I’m out for my hike this afternoon, or if there’s going to be enough of a gap in the precipitation for me to take care of some chore outside. Still, it’s the sort of info you can’t get by checking the Weather Network. 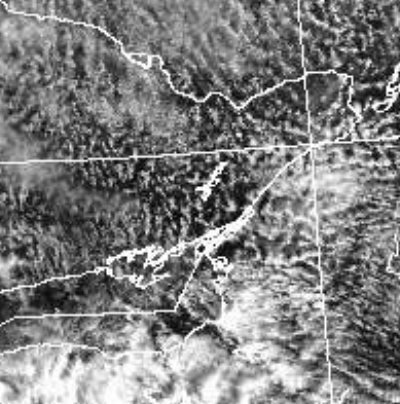 Curious as to what this pattern of rain looked like as clouds, I checked the corresponding Environment Canada satellite image for our area. It looked, unsurprisingly, exactly like the radar did, only as clouds. I tried to do some poking around online about cloud formations and what would cause the clouds to pattern like this, but couldn’t find anything helpful. I did learn that when you see this pattern of clouds on a smaller scale, as in standing on the ground and seeing a freckled sky above, that sort of cloud formation is altocumulus, which apparently usually precede a cold front, and on a warm, humid summer morning can mean to expect a thunderstorm later in the afternoon. This is what rain usually looks like on the radar. 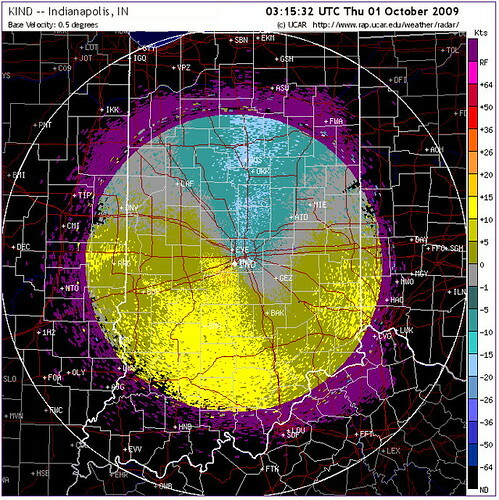 This screenshot was taken from a US radar page, from the National Center for Atomospheric Research, rather than the Environment Canada one, because EC doesn’t log past radar images, at least not accessible by the public, while the US page allows you to look at radar images from up to five days ago. This is the reflectivity radar image from a station south of us, in New York. It still covers our part of Ontario fairly well. This image was from Monday afternoon, when we had a big rainshower pass through. You can see how at the edges of the mass of precipitation the colour is blue, signifying light rain, and the further toward the center of the mass you get, the brighter the colour, till it’s a very heavy yellow rain in the middle. Both the NCAR and the EC radar pages allow you to run loops of several images in a row – you can play back an hour’s worth of images (or more, if you choose) to see how fast the precipitation is moving, and in what direction. This is what I do to try to determine if I have enough time before the rain arrives to accomplish something. If you know the length of your loop, and how far the precipitation traveled during that time, you can figure out when to likely expect it to arrive. (Make a note that with the NCAR images their timestamp, and what you choose from the dropdown when creating a loop, is in UTC, aka Greenwich Mean Time). Forecasting your own weather may not be the coolest thing about radar websites, though. 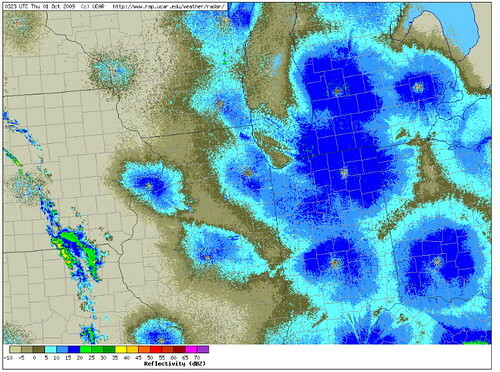 Forecasting bird migration – that’s right, I said birds – is most likely the coolest thing you can do with radar. At night, starting at dusk and continuing till nearly dawn, during spring and fall the skies fill up with millions upon millions of birds as they head south (or north). Each one of those birds reflects the radar. Normally, a single bird wouldn’t be enough to register on these images, but when you start getting them in the densities observed during migration, they become visible. 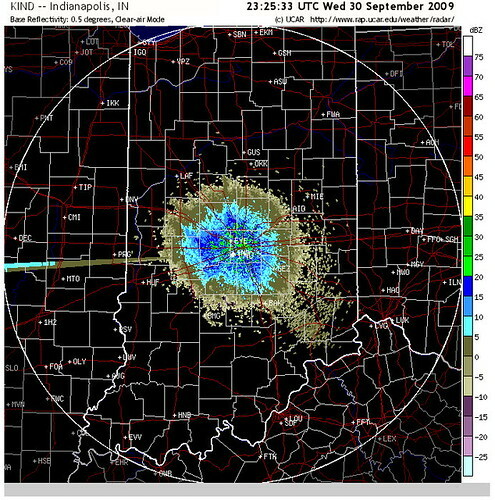 The above image is a screenshot of the Indiana radar, taken just before midnight tonight (Wednesday). This is what birds look like on the radar. You’ll notice three things. First, the shape of the mass is nearly perfectly circular. 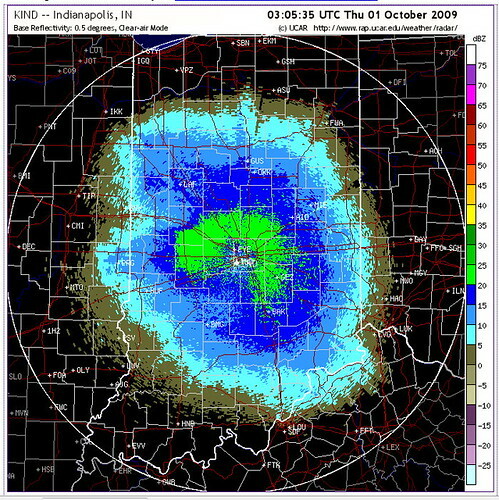 Unless the radar is situated in a mountainous region where the radar’s sightlines are broken, birds will always show up as a circle because they’re everywhere in the sky, so the radar’s entire sweep will detect birds. Second, the edges of the colour start with brown, not blue. Blue is the middle colour. The very brightest is green, at the centre. This is because of the altitude that birds fly at, relative to where along the stick-in-the-water. Most birds fly closer to the mud than the water’s surface, so even though the birds are evenly distributed horizontally along the pond, the stick is only going to register high densities where the stick actually passes through high densities. The far end of the stick, where it exits the water, is much too high above the high densities at the pond bottom to be able to register them. Even at their most abundant, birds also fly at lower densities than rain does, so their fringes start with the lower-density brown and never get any brighter than green. Third, take a look at the resolution of the two images, the birds and the rain. Note how fine the “particles” look in the bird image, versus how blocky the rain looks. I think they’re actually displayed at the same resolution, but the birds look more fine-grained because they’re an even density throughout, whereas rain clouds by their nature show up on the radar in irregular patches. Okay, there’s also a fourth thing to note. This only works at the NCAR site, not at the EC site. If you select the velocity option instead of the reflectivity, it will show you what direction the detected mass is moving. This is illustrated by colour. The radar station is a dot in the very centre of the image. I’m not sure what the unit is on the scale at the right of the image (knots, probably), but anything above 0 is moving away from the station, and anything below 0 is moving toward the station. So grays and blues are moving toward, and yellows and reds are moving away. Birds usually register lower numbers – here, it’s about 10 knots – while storms are often faster. Because the birds are all flying in approximately the same direction, you get a very strong directional movement on the velocity screen, as represented by a nice sharp horizontal line across the middle. In this image all the blues and grays are above the station and the yellows and reds below it – everything is moving south. In the case of rainstorms, the movement is often west to east, or southwest to northeast, or etc. Very rarely is it north to south or south to north, as it is with birds. On the NCAR site you can also choose to display the regional reflectivity, or multiple radar stations all shown together in a composite image (EC also has something similar). Here’s the regional radar for the midwest, from just before midnight tonight (Wednesday). It shows a band of rain in the southwest, associated with a cold front I assume, which appears, by the way it’s curved, to be moving east-northeast. Over in Michigan, Indiana and western Ohio, bird migration is booming. Further west, toward the incoming cold front, the birds aren’t moving in large numbers, perhaps put off by the weather. Right immediately around the band of rain there’s only a speckling at the radar stations, and this may or may not even be birds – even radar images from the middle of the afternoon on clear, sunny days will show a bit of speckling, which may be birds, insects, dust or pollution, or other things in the air that are reflecting the radar back. Migration “fallouts” occur when there is strong migration overnight, and precipitation rolls in halfway through the night. If the rain comes in too early, birds won’t take off at all, they’ll just stick it out another day, but if it doesn’t come in till after a few hours, birds will already be on the wing. They’ll look for a place to put down to avoid flying through the nasty weather. If you’re watching your radar, and you see rain coming in to interrupt a heavy bird migration, there’s probably going to be a fallout as a result. So call in to the office, tell them you came down with food poisoning overnight and book the day off work. You just know the birding is going to be good that morning! A word of advice to folks in Michigan, Indiana and Ohio – if you haven’t already booked Thursday off work, try to go in early or head out at lunch, because I suspect your local birding spot may be busy… too bad that rain won’t make it through in time to down stuff mid-flight. And finally, I can’t embed this, so you’ll just have to follow the link, but it’s very cool to see so I highly recommend that you do. :) This link should take you to tonight’s (Wednesday’s) radar loop for Indiana. It’s a three-hour loop starting just before sunset and going to about 10 pm. The first couple of images are just radar noise, but then you should see one with a big spike coming off it to the west (shown above). The spike is called a sun spike, caused as the sun sets and hits the radar at the same angle as the radar is projected (you’ll see one in the east as the sun comes up in the morning, too). 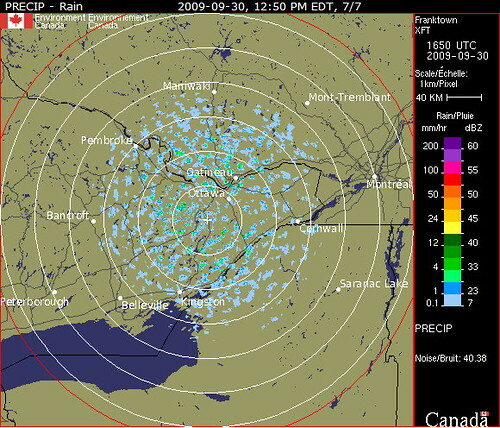 Almost immediately after the sun spike, the radar image begins to bloom and grow as birds take to the air. Excellent article – helped me to understand radar images. Thank you. Wow, that is really interesting. I had no idea radar picked up birds. Thanks! Cool? That’s mind-boggling! What can’t we accomplish with technology? You and southern FL… granted, they track radar migration consistently, but check it – http://badbirdz2.wordpress.com/ – pretty darn handy =) I wonder what else radar will tell us eventually. Don’t forget about bats – they can show up on radar too! I’ve also read about researchers using radar to track migrations of dragonflies. This is a good explanation of how to read radar images. For the past few years I’ve been checking the radar for rain during the day and at night before birding outings to see what to expect. Seeing the noise around the radar station is a bit disconcerting… it makes me wonder about the air quality. One thing I’ve noticed is that birds only seem to show up if the radar is in clear-air mode rather than precipitation mode. I’m not sure if this is because birds aren’t flying or because precipitation mode somehow excludes objects smaller than rainstorms. It’s particularly noticeable at radar stations that have a small rainstorm somewhere in their range but otherwise seem favorable for migration.